So, you want to learn how to play soccer and be really good at it? Or are you a soccer coach or parent who wants to help their kids learn how to play soccer? If so, you’ve come to the right place! In this comprehensive post we will discuss all of the soccer tips, guides, and tutorial videos to help you or your kids learn how to play soccer! Additionally, we will cover soccer equipment, soccer uniforms, as well as selected soccer video guides for each tip! Scroll down for ‘soccer games for kids’. We’re not saying that your kid has to start memorizing the soccer rule book, but it would help if an older kid or parent explained very quickly the basic rules of soccer. It would be even better to show your kid what a real soccer court looks like, whether it’s a field or even a blacktop, as a great way to help them visualize the soccer game upon first hearing about it. Familiarize your kid with the soccer ball by simply having them kick it around – either against a wall or into a goalpost. Some parents may even let their kids tap a soccer ball around the house just to get used to it, but we’d understand if you are hesitant to do so!! Now that your kid has practice soccer skills, drills, played soccer games, and has is familiar within the semi-competitive nature of soccer games, they should join a team with a coach. This will allow your kid to develop further as a soccer player in a structured environment, while both learning how to play soccer for kids, and getting better under the guidance of a coach. It’s important to have fun! Assuming your kid has learned how to play soccer, plays soccer with friends, plays on a soccer team, and practices soccer drills, well, they might want to relax with soccer as well. By watching professional soccer teams with stars like Messi, any kid can learn more about soccer, dream about becoming a soccer star, and enjoy soccer in a fun, relaxed way. UNICEF Kid Power is all about being active, and this entire soccer article is all about being active on the soccer field. However, sometimes your kid may want a break, and it could be fun for your kid to play a soccer video game to get a better feel for the strategic side of the game, as most soccer video games will have the video game player act as a coach. The first portion of this Soccer for kids tutorial page will focus on physical practice, training, and tutorials, and will include lessons on how to kick a soccer ball the right way, and many other soccer ball fundamentals, tips, and tricks. The Epic Soccer Training YouTube channel is a great soccer resource for anyone wanting to learn soccer, especially for coaches, parents, and kids. In this video on how to kick a soccer ball, the host shows how to properly kick a soccer ball with both left and right feet. The correct soccer kicking form is crucial in order to generate power, even if you have a small frame. Most coaches don’t teach this proper form, which is why this could be a great element to your soccer game. The important aspect is to kick with the inside base of your foot. The biggest mistake is that kids will kick the ball at the end of their foot (better for a chip). But hitting the soccer ball from the base of your ankle gives you more power, as your foot is more locked in and can generate much more power. As you kick the ball, you have to drive through fully, thereby sending the ball forward, on the ground, with a nice amount of power and drive. The follow through also needs to be quick, with torque, and your shot will be a nice line drive, hopefully into the goal! Start your kick by taking 5 steps backward, (or leaving yourself 5 steps to run through), and it can be at a 45, 60, or 90 degree angle, depending on your preferred position. Because the goal of this kick is curve and not power, you want to use the top inside of your foot, closer to your toes. When you strike the ball, you want to aim for the spot on the ball that is slightly under the middle mark of the ball. This gives the ball lift as you hit it. And as you follow through with your foot, the ball will naturally curve, depending on where you aim and follow through. Watch the video to see slow motion replays to really understand how to kick the soccer ball with curve. Once you have mastered the two primary soccer kicks, it is time to learn how to dribble a soccer ball. Any kid who can dribble a soccer ball will be way ahead of time. Additionally, Progressive Soccer is a great video channel on YouTube and easily demonstrates how to dribble a soccer ball in this video tutorial. The main focus of dribbling a soccer ball is to keep the soccer ball next to you at all times. The way to make his simple and easy is to have lots of little touches, instead of just a few powerful touches. Constant light touches on the soccer ball will keep you on your toes and the ball close to you. Soft and delicate is the key. If you have space, then you can take a bigger touch, assuming you are starting to sprint with the soccer ball. The difficult part of dribbling a soccer ball involves cutting. The way to do this is with speed and precision. If you need to cut to the left or right, quickly tap the ball in that direction. In order to get a nice soccer dribble going, you can do this back and forth in an effort to lose your defender. Basically, the more active you are with your cuts, the better you can dribble the soccer ball until you are ready to pass or kick! Chipping a soccer ball is what separates the beginners from the pros. If you can learn to chip a soccer ball, you will definitely be ahead of your peers, especially if you are in a younger class of players. Chipping a soccer ball is basically kicking a curveball, but in a straight direction. It can be used as a pass or shot, but mainly for passing. So, if there is a defender between you and your defender, you can lob it over, directly into your teammates legs. The basic premise for any kid to be able to chip a soccer ball involves striking underneath the ball, by turning your foot out, and hitting it with the big toe part of your foot. It is important to lean back when you hit it, and to follow through with your foot really low to the ground, and not high. The midfield players on a soccer team are hugely important to the success of any soccer team, and are often described as “the busy players, the engine of any team”. Their job is to support the tackle while moving toward the goal, while playing both offense and defense. Describing how to play midfield would be tricky to do in words, so it’s best to watch the professional soccer coaching video we’ve posted below, courtesy of the Live Strong YouTube channel. Defense is crucial for any team to win a soccer game. In this awesome video from SoccerBasics101, we learn that the key to become a good soccer defender is instinct and sacrifice. The ultimate key to defending, according to this video, is to be aware of everything: attackers, their movement, and all space that is created. The video on how (kids) can punt a soccer ball from ARS Goalkeeping will show you how to punt a soccer ball with extra accuracy, and how to add maximum power to your punt. A good punter will keep opposing team defenses far back and is super important for any winning team. We’ve got another great video from Progressive Soccer, in which we scale out and talk about how to get in shape for soccer season. If you’re kid wants to be the best on his soccer team, then make sure to show them this getting in shape soccer video! 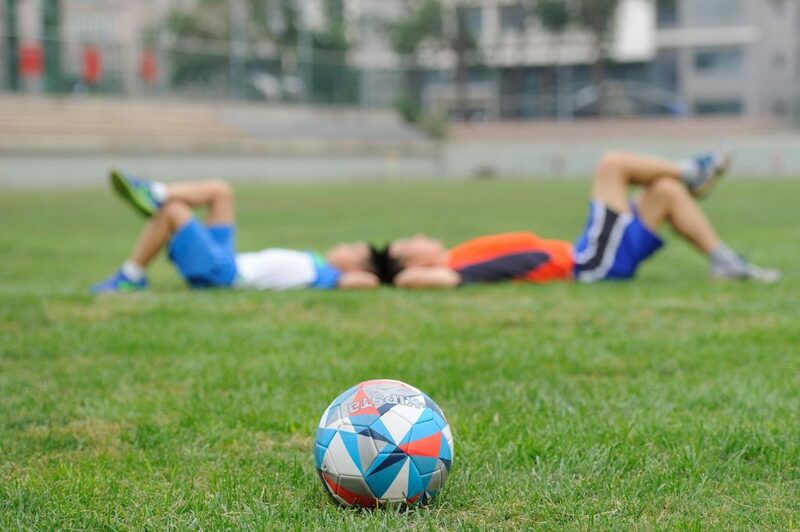 This soccer training includes yoga pushups, squat jumps, tuck planks, as well as a run. It would be ideal to do this training while watching the video demonstration. The link in the YouTube description offers a free soccer training course! Juggling a soccer ball isn’t necessarily going to help your kids’ soccer team win games, but it will definitely be a cool skill to learn, and of course, likely helps improve overall soccer familiarity and dexterity. This video from AllAttack demonstrates how any kid can to learn to juggle a soccer ball. The most important aspect is a mental one, as every juggler needs to maintain focus while they juggle, and to be persistent as well. Eventually, any kid juggler will develop the proper muscle memory so that juggling becomes second nature. Another interesting facet is the usage of hands: when training for this, you don’t need to actually juggle perfectly, in fact, it is ideal to use your hands and catch the ball in between each kick, so that you get familiar with juggling in a comfortable way. Below are a few video tutorials that we found helpful for kids who want to learn how to take care of their soccer uniform, cleats, and general soccer equipment. Check them out! Cleaning soccer cleats might not come to mind as an important part of being a soccer player, however, it is an important for your kid to make sure his cleats are clean: this way they last longer, and your kid will probably have a better soccer performance! We found an awesome video courtesy of Cleatstagram, who explains in depth how to clean up your soccer cleats. With a combination of Mr. Clean and soaking laces in hot water, your kids’ soccer cleats will be cleaned up in no time! In addition to cleaning your soccer cleats, your kid will likely want to break them in. Brand new soccer cleats can be notoriously stiff and tricky for any kid to break in. This helpful video courtesy of Football Boots YouTube channel explains how to use a combination of hot water and newspaper (that’s no typo!) in order to speed up the process of breaking in your soccer cleats. You can’t just put on a shin guard to protect yourself while playing soccer. There is a proper way to do it, and it is important for kids playing soccer to know how to properly wear shin guards. This one probably applies more to soccer moms and dads rather than kids, since not too many soccer-playing kids are washing their soccer jerseys these days. Regardless, learning how to wash your kids’ soccer jersey is a useful skill. One of the most underrated ways to make your kid a better soccer player is to keep soccer on his mind all the time. This means having a soccer post and net in your backyard, and making soccer a daily routine. When your kid gets home, make sure to encourage him or her to kick around the soccer ball. It is helpful to have your kid play soccer in a friendly manner – instead of kids’ soccer drills, come up with soccer games that your kid can enjoy. With enough practice, your kid can become the next Alex Morgan in no time! On Saturday’s and Sunday’s, if your kid usually lays around the house and watches TV, make sure to encourage him or her to kick around the soccer ball. Tell your kid to invite over friends so that they can have a friendly soccer match. Additionally, it helps if one of the parents is outdoors too, playing soccer and leading by example. This will encourage your kid to follow suit. 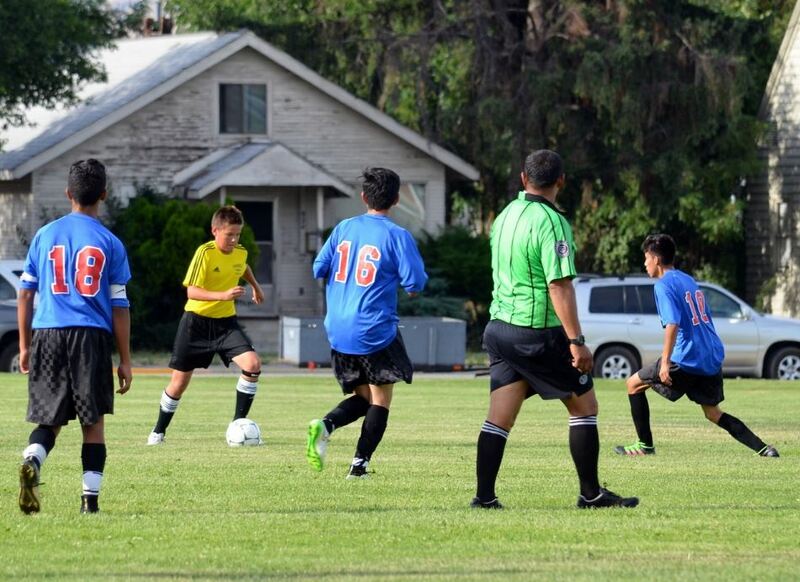 Once soccer becomes part of your daily life, your kid is sure to improve his skills and become a better soccer player. One other method to help your kid get better at soccer is to enlist your kid in local soccer leagues. Nearly every mid-major city has a youth soccer league for your kid to join. Maybe you can join as a parent coach, or get involved with the league in other ways. By having your kid join a soccer team, he or she will be exposed to ongoing soccer practices, and weekly soccer matches (depending on the league schedule). And if your town does not have a soccer league, then consider exploring this for yourself. Ask your friends if their kids want to take part in a local friendly match, and if there is enough interest it can become a weekly soccer game. You’d be surprised at how many families – specifically parents, who will be happy to send their kids off to soccer matches in their local towns, with friends, acquaintances, and neighbors. Once the kids show up, you don’t even need to referee the game. Just let the kids play and choose teams on their own – they’ll figure it out and have fun. It might even be fun for parents too – they get to hang out and mingle with one another, motivate their kids from the sidelines, and even offer some light soccer coaching for their kids. Pre-School Kids Learning Soccer: Kids above the age of 2 are able to start truly learning how to play soccer. Ideally they will need a size 3 soccer ball with 12 ounces of weight. The circumference of the ball should be approximately 22 inches. You can ask any sports store rep and they can recommend a pre-school soccer ball for your 2-5 year old kid. In addition to the soccer ball, you’ll also need a soccer net, and they sell official children’s soccer nets which you can buy. In terms of skill building at the pre-school age, every kid will be tempted to kick, but it’s important to stress dribbling at first. You can demonstrate dribbling and have your kid mimic you in the process. Perhaps offer a point system for the total number of seconds that your kid can successfully dribble without kicking. The next step is ball control. The most basic form of ball control involves catching a pass from another player without the ball bouncing off your legs. This is difficult to do and must be trained from a young age, but once your kid masters this, they will be better than anyone else. What your kid should do is practice catching the ball not just with their feet, but also with the stomach or chest. Because this is more physical, it is best done at the age of 5 or 6. Kindergarten – Second Grade: By the time kids reach the age of 6, they can start to truly play with a slightly more elite level of skill involving subtle aspects of the game, including dribbling and catching the soccer ball. At this age, soccer player kids can use a size a 4 ball that measures 25 inches and weighs between 13 and 14 ounces. In terms of skills to practice, these kids should focus on the more fundamental skills which will make a focal point of their respective soccer teams. This means they must improve their kicking and shooting ability. If you’re playing with your kid in the backyard, this would involve kicking the ball to them and having them shoot or kick toward the net, by either catching and kicking or directly kicking your pass. Both of these are great training endeavors. By getting them familiar with different types of passes and positioning, this can be very advantageous. Grade 5 – 7: This is the age where soccer players become elite. As kids start to grow, they have more muscle, stamina, and general physical ability to partake in team soccer sports and display skills. This is the age where training and practice are crucial – all of the soccer greats trained multiple times a week and even more than once during the day! Training should entail long passing sessions, with catching and kicking from different positions and even far ranging distances. Make sure your kid practices kicks to the net from point blank range all the way down the other net. Displaying kicking dexterity and range will be a big part of your kid’s soccer game development. Soccer skills for kids is something that must be taught from a young age, with a steady schedule of drill practice, training, but also having fun. In addition to this basic soccer skills for kids page, we have produced additional kids soccer content which you can find below. Fun soccer games for kids: Soccer games make learning soccer skills so much easier and fun for kids! Toddler soccer: training drills and toddler soccer programs: You don’t need to be 8 years old to play soccer – babies can play too! How to coach kids in soccer: Coaching kids in soccer and teaching them soccer skills can be tough – check out our guide! Soccer drills for kids: Kids soccer drills are now easy and fun with our quick guide. Soccer coaching games for kids: Soccer is taught through coaching games, which will help increase your kids soccer skill level. What age should my kid start playing soccer? 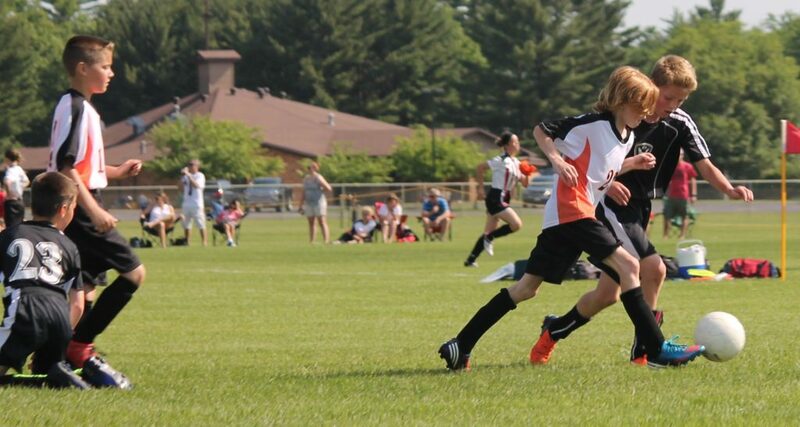 It seems that there is no minimum age requirement to start playing soccer – read to see why. Kids soccer positions: explained There are many soccer positions for kids to play – we make sense of all of them and explain the basics. How to kick a soccer ball for kids: Kicking a soccer ball is a soccer skill that many kids try to master – read to see how. Why is soccer important for kids? Soccer is definitely looked at as one of the most important sports for kids to play. Why do kids love soccer? There is a reason as to why kids love soccer – we break it down here.